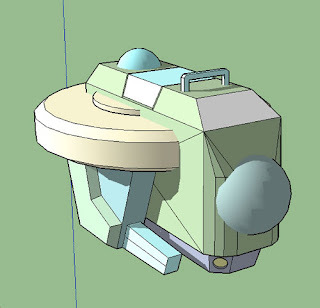 Spent a couple ofhours building a model in Google SketchUp. I haven't used it for a couple of years and had forgotten what a useful little tool it is! I'm pretty awful at drawing machinery, vehicles and buildings freehand, so I find models and reference material extremely helpful. 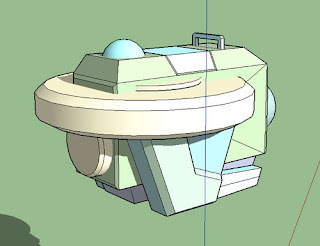 And because the comic I'm currently working on features a little robotic drone as one of the main characters, I decided I'd need a good way of remembering how he all fits together... hence SketchUp! 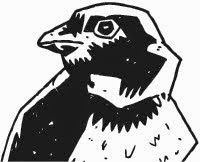 When I'm drawing the comic I'll essentially rotate the model into the position I need and then use that image as a starting point for drawing the drone. With this particular comic I'm experimenting with some new styles, so may get a (real life!) model to pose for my human character as well. It keeps things interesting anyway!